2004; 373 pages. The third book in the Thursday Next series. Genre : Literary Fantasy. Overall Rating : B+. With Spec-Ops, Goliath Corp., and Aornis Hades after her; and since she's with child and without her husband; Thursday decides to get into a book. Literally. It's a great place to hide. Caversham Heights is an atrocious yawner of a novel that no one in his right mind will ever read. Of course, the peace and quiet is short-lived. Murder and mayhem are afoot, and Aornis implants a memory worm in Thursday's head, meaning all her recollections about her hubby Landen are fading fast. 98% of the book takes place in the literature world that Fforde's created. And what a world! The generics (minor characters initially without any character development) are cool. Grammasites run rampant, not to mention a 420-pound, 7'4" feral Minotaur. There's murders to be solved and lots of book-jumping. 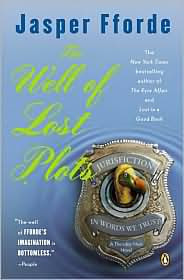 Fforde manages to tie up most of the plotlines he creates in WOLP, but no progress is made on any of the loose ends carried over from the first two books of the series. Landen is still MIF (Missing In Fiction); Thursday's dad is still on the run, and her brother Anton's death promises to be a major topic at some point in the future. About all that's changed by the end of WOLP is that Thursday has trouble buttoning her pants. The book culminates with this spoof of the Oscars. Dastardly deeds are laid bare, and the murderer is unmasked, but it's the awards that steal the show. Among the hundreds of Categories are : Most Implausible Plot in SF; Most Creepy Character in a Dickens Novel; Most Troubled Romantic Lead; Best Talking Cat; Most Incomprehensible Plot; The Shakespearean Character You'd Most Like to Slap; and Best Dead Person in Fiction. Hey, I'd certainly tune in to watch this Awards Ceremony. In summary, WOLP is good, but not great. The plot takes a while to get going, and the book has the overall feel of existing merely to set up the next one. Nevertheless, I enjoyed it, what with all its book-jumping and literary allusions. Perhaps the whole series will only appeal to a dyed-in-the-wool bibliophile. Then again, doesn't that describe everyone at 5-Squared? I love the book award categories! I so need to read the second book in the series...I'm so far behind. I don't think those plotlines are going to tie up though. at least one does by the end of #5 ("First Among Sequels"). but i think Fforde intends to run with this series for a long time, so i'm not expecting closure anytime soon. Really? I thought the fifth book was the last. Not sure where i got that idea. i picked up FAS at Borders on saturday for $3.99. it won't get read for a while (so what else is new, Terry? ), but i briefly browsed thru it. on the last page, Fforde says, "Thursday Next will return in...", and then offers nine witty possible titles. my guess is that he's going to concentrate on the Nursery Rhyme series for a while. he also has one coming out (or already out?) called Shades of Grey, which looks like it starts a third series. FWIW, there's kind of a hint of synesthesia in SOG. my fear is that he'll spread himself too thin. Robert Asprin did that, with dire results to his "Myth" series. Ditto for Eric Flint in his "1632" series. the SOG blurb in First Among Sequels said it would be released this summer. but i just checked at Amazon, and they now say the release date is 29 December. which i don't believe one bit. what a sucky release date - right after Christmas. i look for it to be pushed back some more. and no, Something Rotten wasn't in the Borders bargain bin. but it's at the library. I really need to get around to reading the rest of the books in this series! I own them... It is just a matter of reading them! i'm hooked on them, Kailana. by July, i'll be scrounging the bookstores, cuz i'll be done with the Thursday Next series, and that's all my local library has by Fforde.